Few cuts of beef are as well-suited to share the same plate as the New York Strip and the Filet Mignon, and together they make a regal pair. The robust, distinctly meaty flavor of the New York Strip complements the buttery-soft and uniquely fork-tender Filet Mignon like no other. Both cuts are hand-trimmed and expertly wet-aged for 21-30 days, for a mouthwatering dining experience. 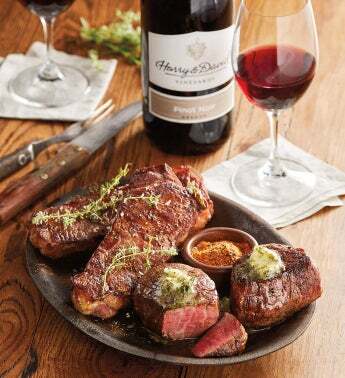 To add even more distinguished flavor, we&apos;ve included a tin of Peppercorn Steak Rub and a perfectly paired bottle of Harry & David™ Pinot Noir.